This beautiful MAIN FLOOR CORNER UNIT condo is located in a well managed,secure building in one of the Calgary's most prestigious,sought after communities; The Summit of Montreux in Aspen Estates. 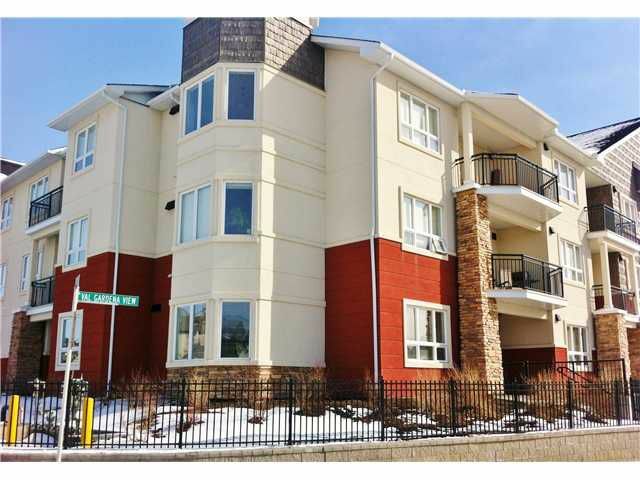 This spacious 2 bed,2 bath unit boasts 9 foot ceilings,extensive upgrades,BEAUTIFUL hardwood flooring and WALNUT cabinetry! This GOURMET KITCHEN features upgraded Bosch appliances and a breakfast bar large enough for four! The dining room is surrounded by a large turret and bay window. Lot's of windows take advantage of the SUNNY SOUTH WEST corner!! Enjoy your morning coffee in your own fenced yard (perfect for your PET too!!) with a patio and natural gas outlet for BBQ. All of this AND 2 TITLED UNDERGROUND PARKING STALLS!! This home is perfect for the most discriminating young professional or couple. Nestled among the rolling hills of the west side a midst aspen groves,20 minutes to downtown,minutes to the future LRT Station and the upscale Aspen Landing Shopping Centre!